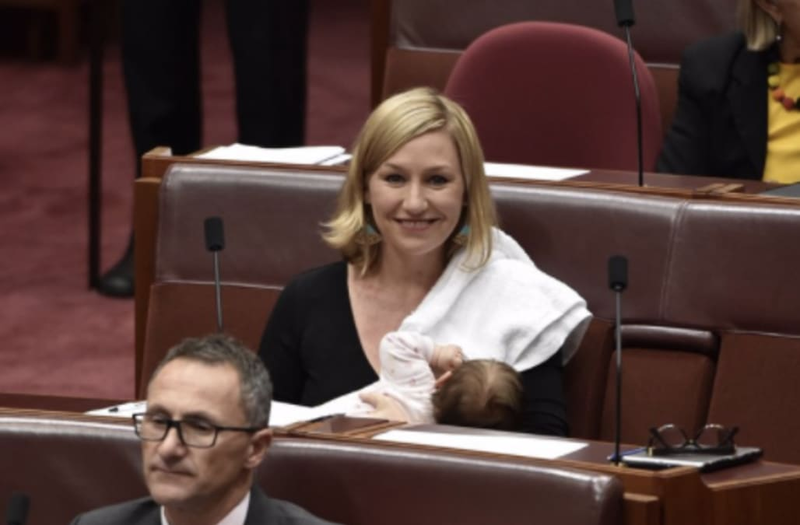 A senator from Australia just made history by breastfeeding her newborn in the middle of Parliament. Queensland Senator Larissa Waters returned to work only yesterday since giving birth to her second child. She retook her seat in the chamber, with her two-month-old in tow. And when duty called, Waters calmly took Alia in her arms and fed her. Only recently did the Australian Parliament change its rules to let female lawmakers nurse in the chamber. According to CNN, Waters was "influential" in that new mandate. "If we want more young women in Parliament, we must make the rules more family friendly to allow new mothers and new fathers to balance their parliamentary and parental duties," the Senator said in November. Some have attacked the lawmakers move. This is the mentality we have running our country. God help us all for the future. Others, however, have defended Waters, praising her dedication to being a lawmaker and mom. They're applauding her work in normalizing breastfeeding. Parliament making womanhood 'normal' and setting the bar for all employers when it comes to accepting women as equals in the workplace.